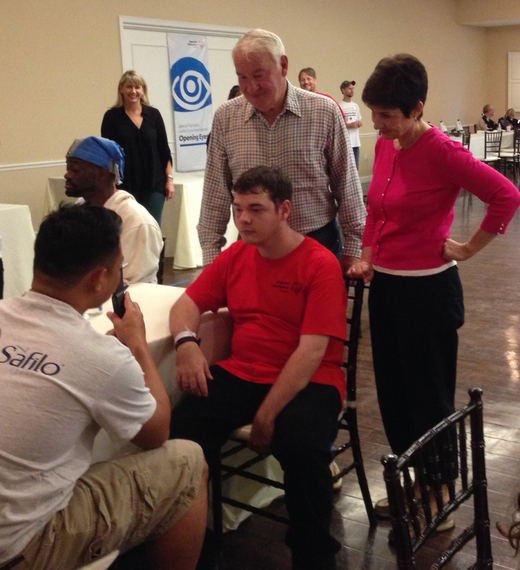 Tom Golisano, Founder of the Golisano Foundation, and Ann Costello, Executive Director, visit a Special Olympics Lions Clubs International Opening Eyes clinic in Florida. "No, you're not welcome here." "I think you could be better treated by a different doctor." "I'm sorry, but we just don't know how to treat you here." This is what people with intellectual disabilities and their families often hear at the doctor's office when they need health services, even basic health care needs like a routine physical. Every parent dreams that their child will reach their fullest potential in whatever they choose to do. And every parent frets at the possibility that their child's potential could be cut short by the lack of access to health care or the scourge of discrimination and intolerance. These thoughts, both positive and negative, impact every aspect of our lives and each of our days as parents. It is no different for parents of children with intellectual disabilities (ID). 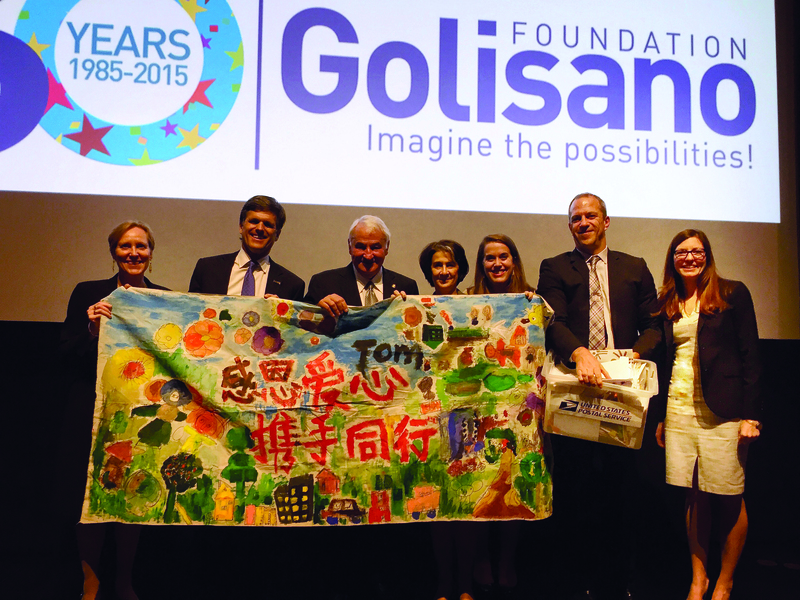 But for those parents, including Tom Golisano, founder of the Golisano Foundation, the reality is that their children make up the most marginalized population on earth. People with ID make up about three percent of the world's population, and unfortunately, due to lack of resources and lack of willingness of health care systems to care for them, they are dramatically underserved. They are much more likely to suffer from preventable poor health and are more than twice as likely to die before the age of 50. Of course, it doesn't have to stay this way. For almost 20 years, community by community, doctor by doctor, change is on the rise. People with ID are less likely to be hidden away in institutions with their wellness ignored, and many doctors have taken steps to make their practices more inclusive. But it's taking too long, lives are being lost, and the overall quality of life for an entire population is at stake. We are determined to accelerate this change through the vision of the Golisano Foundation. Since 2012, Tom Golisano has donated over $37 million to Special Olympics, the largest public health organization for people with ID. And because we want to ensure the unmet health needs of people with ID are not ignored, we are thrilled to announce the creation of the Golisano Health Leadership Awards that Special Olympics will be presenting to the champions and agents of change in this important work around the globe. The Golisano Health Leadership Awards was not just developed to recognize the best in the field of health for this population, it is meant to be a catalyst for change. We can't do it alone. It is our dream that over the years, health professionals and health-focused organizations around the globe will aspire to win this award and create the tipping point to improve access and quality of health care for people with intellectual disabilities. It is time that we begin to truly value and include people with ID and give them the health care they deserve. As a community and a nation, it is our job to do our part to ensure full inclusion of health-care for people with intellectual disabilities. I ask others to join me. Realizing this vision of equality will take millions of dollars but it will also take millions of small acts of kindness and inclusion. What can you do? What will you do? As a first step, you can contact your local Special Olympics Program and learn how you can volunteer your time and talents - whether it's in health, fitness, coaching, fundraising or another skill you have - and become involved with local Special Olympics athletes. You'll be glad you did, and, together, we can be the change. 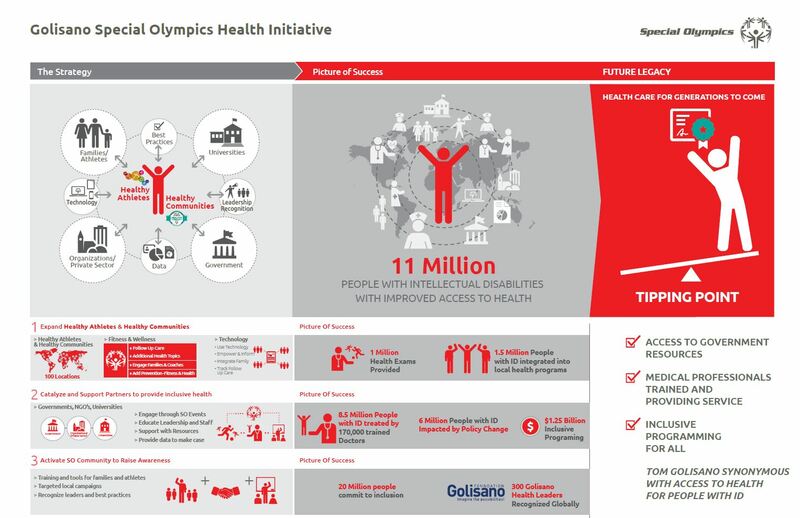 People all over the world are impacted by the Special Olympics Health program, made possible by the Golisano Foundation.